You can configure additional alerts, or change the default settings of pre-defined alerts. 1. Go to Reports > Alerts > Alerts settings. Note: Note that a Guardian license is required to view this alert. For more information, contact your Smoothwall representative. The Web filter violations alert comes pre-defined, but disabled, upon installation. The alert is triggered only if the method used to authenticate users supplies a username. For more information about authentication methods, see Managing Authentication Policies. Note: Note that a Unified Threat Management serial is required to view this alert. For more information, contact your Smoothwall representative. The VPN certificate monitor comes pre-defined upon installation. The Outgoing Traffic Violations alert comes pre-defined upon installation. The System Resource Monitor comes pre-defined upon installation.  System load average warning level (per CPU core) — This is used to set the threshold of the average number of processes waiting to use the processors over a five minute period. A system operating at normal performance should record a load average of between 0.0 and 1.0. While higher values are not uncommon, prolonged periods of high load (for example, averages greater than 3.0) may merit attention.  Disk usage (%) warning level — This is used to set the threshold of the disk space usage percentage threshold before the alert is triggered. Low amounts of free disk space can adversely affect system performance.  System memory (%) warning level — This is used to set the system memory usage percentage threshold before the alert is triggered. The Smoothwall System uses system memory aggressively to improve system performance, so higher than expected memory usage may not be a concern. However, prolonged periods of high memory usage may indicate that the system could benefit from additional memory. The Firewall Notifications alert comes pre-defined upon installation.  Monitor source (remote) IP addresses — Select this to disable this alert. This detects suspicious inbound communication from remote IP addresses. Alerts will be generated if a rapid series of inbound requests from the same remote IP address is detected. • Warning threshold — Enter the number of hits from the source IP addresses before the warning alert is triggered. • Incident threshold — Enter the number of hits from the source IP addresses before the incident alert is triggered. • Ignore — Enter a comma-separated list of source IP addresses that should be ignored for this alert.  Monitor source (remote) ports — Select this to enable this alert. This detects suspicious inbound communication from remote ports. Alerts will be generated if a rapid series of inbound requests from the same remote port is detected.  Monitor destination (local) IP addresses — Select this to disable this alert. This detects suspicious inbound communication to local IP addresses. Alerts will be generated if a rapid series of inbound requests to the same local IP address is detected.  Monitor destination (local) ports — Select this to disable this alert. This detects suspicious inbound communication to local ports. Alerts will be generated if a rapid series of inbound requests to the same local port is detected. The System Service Monitoring alert comes pre-defined upon installation.  Select the components, modules and services that should generate alerts when they start or stop. The Health Monitor alerts are disabled upon installation.  Web server (HTTP) — This alert will retrieve the specified web page, and check for specific keywords. If the keywords are missing, an alert will be triggered. • Request URL — Enter the URL of the web page to monitor. You can omit http:// when entering the URL.  Other services — This alert checks the specified port is open and offering a service. • Protocol — From the drop-down list, select the protocol of the service you want to check for a response. Select Other to check that there is any response to connections on the associated port. • No of tries — Enter the number of times the Smoothwall System should check the address and not receive a response before generating an alert.  DNS name resolution — This alert checks that a domain has not expired, or been taken over. The Web Filter URL Violations alerts are disabled upon installation. The Inappropriate word in IM Monitor comes pre-defined upon installation. • Threshold — From the drop-down list, select the threshold above which an alert will be generated. For information about the Message censor threshold, see Censoring Message Content . • Threshold —From the drop-down list, select the threshold above which an alert will be generated. • Number of inappropriate messages in 15 mins — Enter the number of times users can use inappropriate messages in 15 minute before the alert is triggered. This alert is disabled upon installation. When configured, these alerts are triggered when malware being relayed via SMTP or downloaded via POP3 are detected. • Monitor POP3 proxy for viruses — Select to enable alerting when malware is detected when loading via POP3. • Monitor SMTP relay for viruses — Select to enable alerting when malware is detected when relaying via SMTP. 2. Click Save to enable the alerts. This alert is disabled upon installation. This alert is triggered when the number of messages in the email queue exceeds a the specified threshold. • Threshold number of messages — Enter the number of messages above which the alert is triggered. 2. Click Save to save the settings and enable the alert. This alert is disabled upon installation. • Monitor for failed NTLM Authentication — Select to enable this alert. The Bandwidth Monitor alert is disabled upon installation. Note: Each alert you configure can only monitor traffic in a single direction. 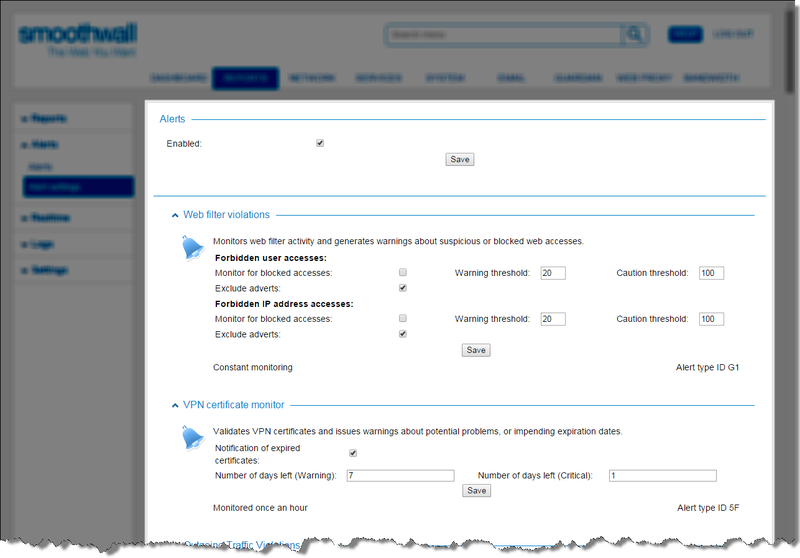 However, you can configure multiple Bandwidth Monitor alerts to enable you monitor all traffic. • Single application — A single, specified application. A additional drop down list will appear for you to specify the application. • Single application group — A single, specified application group. A additional drop down list will appear for you to specify the application group.  MB — The maximum amount of data usage, in megabytes, permitted before the alert is triggered.  kbps — The average data transfer rate, in kilobits per second, permitted before the alert is triggered. Note: The Smoothwall System calculates the bandwidth used to two decimal places. The Intrusion System Monitor is pre-defined upon installation.  Priority — From the drop-down list, select the appropriate priority level for this alert. The Global Proxy alert comes pre-defined upon installation.  Monitor for incorrect certificates — Select this to disable alerting when a client fails to present the correct certificate. This is either due to the client having the wrong certificate, or due to unauthorized access.  Monitor for D0S attempts — Select this to disable alerting when a client, with a valid certificate, repeatedly attempts a connection. Repeated connections from a client are assumed to be a Denial of Service (DoS) attempt. 3. Click Save or Add.